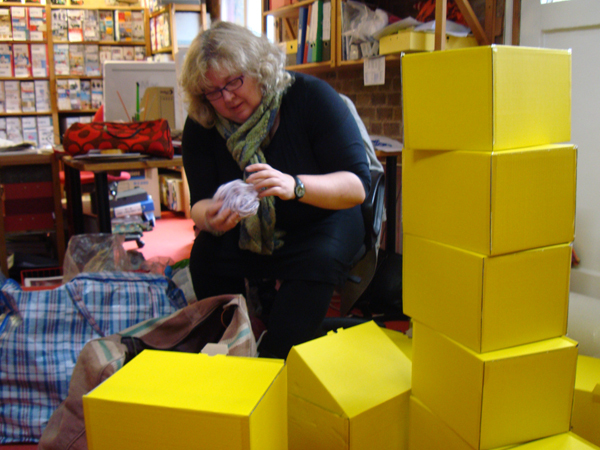 Jane is busy boxing up packs of yarn, needles and patterns, kindly donated by Knit for Peace supporters, to be sent to women’s refuges across London. Special thanks go to Loop knitting shop for supplying the free knitting patterns. My mother in law is still knitting jumpers for the fish and chip babies – as are some of our Wi Members. Could you tell me please if you are still accepting these? She has also knitted some of the bigger jumpers. If you have too many of these now – do you require anything else. I would be pleased to hear from you. Hi Pauline, if jumpers are already knitted we are still accepting them and finding good homes for them. However, for future items we find long sleeve jumpers. Some knitters have adapted the Fish and Chip jumpers to include long sleeve, while others have used simple long sleeve jumper designs. We always need jumpers for older children so it’s great your mother in law has knitted some. We also need mittens, hats and scarves for children, and bootees and mittens for babies. Thanks for your reply – can any patterns whatsoever be used for the hats, scarves and bootees and mittens – or are there suitable ones on your website? Hi Pauline, you can use any pattern you like. There are some free ones on ravelry, or you can use patterns on our website. Hi Sjaal, thank you for your comment.